SCAM ALERT – The City of Houston is not sending emails to request payment for parking citations. 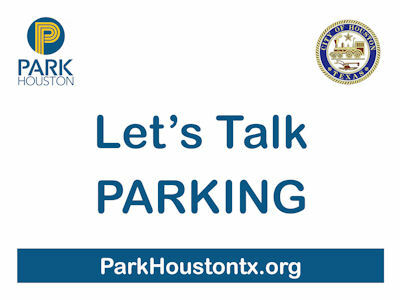 ParkHouston is a Division of the Administration & Regulatory Affairs Department. By servicing and maintaining 9,200 on-street parking spaces across the Greater Houston area, ParkHouston creates sound regulations for all commercial and residential areas enhancing pedestrian safety, ensuring a smooth flow of traffic and allowing emergency vehicles to reach their destinations. As the parking management division for the City of Houston, we also encourage parking awareness while supporting public transit initiatives. The City of Houston is considering recommendations for a pilot Dockless Vehicle Program. Read the Stakeholder Recommendations document (.pdf). You may review some of the Stakeholder Committee Recommendations (.xlsx). Download the spreadsheet and insert your feedback. Send the document with feedback to parking@houstontx.gov by close of business on December 12, 2018. Dockless vehicles are systems of bicycles and/or scooters that are available for short-term rentals for point-to-point trips. These may be locked and unlocked using a smartphone app without the requirement of a bicycle rack or other docking station. ParkHouston supports the City of Houston’s economic development by providing superior customer service, investing in cutting edge technologies, and actively collaborating with stakeholders. As a solution-focused division of the Administration and Regulatory Affairs Department, we service and maintain over 9,200 on-street parking spaces across the City. We create sound parking management strategies for commercial and residential areas that enhance pedestrian safety, ensure a smooth flow of traffic, and allow emergency vehicles to reach their destinations. ParkHouston also works to create more sustainable communities by reducing congestion and supporting alternative modes of transportation. NOTICE: We have received information regarding a parking citation SCAM. Please note that the City of Houston Parking Management Division does not request payment via email or by postcard. 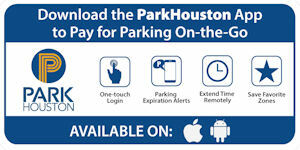 If you have received this, you can check for any open parking citations at https://houstonparking.t2hosted.com/cmn/index.aspx or please contact the Houston Help Line at 713.837.0311 (3-1-1). Like many communities, the City of Houston strategically places parking meters in areas where parking is in high demand. By managing curb-space, meters allow more drivers to easily find parking and identify spaces designated for public use. Meters also help create parking turnover by keeping spaces from being used for extended periods. On-street and lot meter durations, rates and times vary according to the time demand at each location. Meter durations range from 30 minutes to 10 hours, depending on parking needs. Rates also vary and are predetermined according to parking studies performed before meters are installed. Responsible for the administration of on-street regulations in Chapter 26. In partnership with the Department of Public Works and Engineering, added on-street ADA compliant parking spaces in the Central Business District, Midtown and East Downtown. Established the first citizen-led Parking Commission in the state of Texas. ParkHouston partners with Zipcar to offer car-share in on-street spaces – sign up now at www.zipcar.com.